1B Umpire Dan Bellino ejected White Sox Manager Robin Ventura for arguing an out (base path deviation of three feet to avoid being tagged) call made by 2B Umpire Tom Woodring in the bottom of the 2nd inning of the Yankees-White Sox game. * With none out and one on, White Sox batter Adrian Nieto hit a 0-1 slider from Yankees pitcher Vidal Nuno on a ground ball to right fielder Ichiro Suzuki, who threw to shortstop Derek Jeter to second baseman Brendan Ryan in a rundown of Nieto between first and second base. 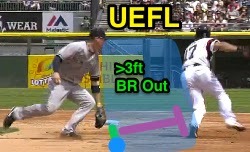 Replays indicate that Nieto deviated in excess of three feet from his base path (direct line between Nuno's current position and the base he was attempting to achieve [second base]) to avoid being tagged by Ryan, the call was correct.^ At the time of the ejection, the White Sox were leading, 3-0. The Yankees ultimately won the contest, 4-3, in 10 innings. This is Dan Bellino (2)'s third ejection of the 2014 MLB Regular Season. Dan Bellino now has 12 points in the UEFL Standings (9 Prev + 2 MLB + 1 Y [Crewmate] = 12). Crew Chief Jeff Nelson now has 6 points in the Crew Division (5 Previous + 1 Correct Call = 6). *2B Umpire Tom Woodring is considered the calling umpire pursuant to UEFL Rule 6-2-c-1-a. This is the 56th ejection of the 2014 MLB Regular Season. This is the 23rd Manager ejection of the 2014 MLB Regular Season. This is the White Sox's 1st ejection of 2014, T-4th in the AL Central (DET, KC 2; CLE, CWS, MIN 1). This is Robin Ventura's first ejection since Sept 1, 2013 (Dana DeMuth; QOC = Y [No Catch/Safe]). This is Dan Bellino's first ejection since May 14, 2014 (Troy Tulowitzki; QOC = Y [Balls/Strikes]).